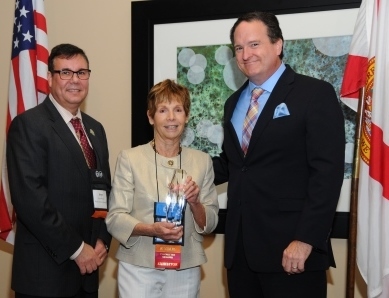 TALLAHASSEE, FL – Aug. 17, 2015 – The Florida Association of Postsecondary Schools and Colleges (FAPSC) has selected South Florida business executive Dr. Susan F. Schulz as the 2015 Associate Member of the Year in recognition of her dedication to private career education and student success. The leaders of Florida’s career colleges – schools focused on providing quality education and training for more than 300,000 students each year – honored the sector’s outstanding graduate, schools, faculty member, administrators and volunteers at its annual conference held recently in South Florida. Schulz, President of Schulz School Advisors, has been an active volunteer and participant with FAPSC for more than two decades. She has served in a variety of capacities sharing her innovative ideas and suggestions for organizational advancement and improvement. She currently serves as a FAPSC committee co-chair. “Dr. Schulz and her dedication to students in our sector is unwavering and without fail – she is always there and we’re incredibly grateful for her time and talents,” said Curtis Austin, executive director of FAPSC. FAPSC has been the voice of Florida’s career schools since 1956. The association of more than 250 members works on behalf of the more 1,000 licensed private career schools and colleges in Florida that prepare students each year for employment in more than 200 occupational fields by offering degree programs, certification and training. Ask us for a list of events of interest to career school decision-makers. Email to tell us about career school-related meetings and conferences.